This is an opportunity for class and school blogs to share interesting posts about learning. The New #ShareOurLearning blog aggregates posts categorised with ShareOurLearning from participating blogs. After you join in with your blog all you need to do is categorise subsequent posts ShareOurLearning and they will automatically appear on this blog. We do not expect school land class blogs to push every post they make here, just ones that showcase learning. 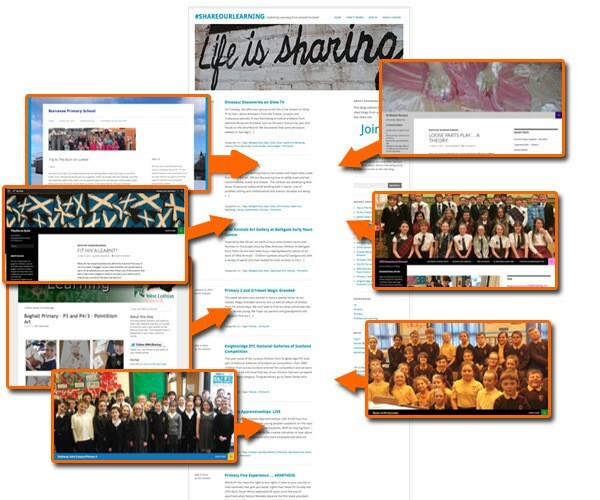 Hopefully posts that appear here will give visitors a view of some of the learning that is going on across Scotland and connect different class together. We hope this will allow classes and schools to see what others are learning and sharing on their blogs easily. It might also allow you to find interesting blogs to comment on and join in learning conversations. You don’t even need a Glow Blog to join in, any public blog that supports RSS for categories or tags can join and share. You can see the syndication plain in action on the #ShareOurLearning | Gathering Learning from around Scotland blog. If you have a class or school blog you can join in.